Apple acquires a $16 billion stake in... Apple! 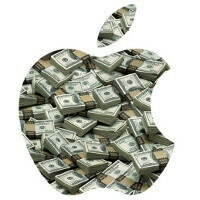 Back in April, Apple announced that it will invest $60 billion in repurchasing its own shares from the public by 2015. Even now, it remains the largest authorized share buyback in history. Tim Cook and Co. obviously weren't kidding, and are actually kicking into an even higher gear – instead of the scheduled repurchase of 10 million shares, Apple went ahead and bought back... 36 million shares. Philip Elmer-Dewitt with Fortune has put this into perspective – at an average price of $444.44 per share, the company spent $16 billion buying itself a stake in... itself. With that kind of money Apple could have snapped a company like Nokia and still have some money left over. "We continue to generate cash in excess of our needs to operate the business, invest in our future, and maintain flexibility to take advantage of strategic opportunities." 36 million shares. Holy s--t that's a lot. Apple is doing some bold moves as of late. Yeah but, too bad it's too little too late as Apple is slowly dying thanks to Samsung. Personally, I think Apple should try using an aftermarket charger on .... itself - instead of buying itself! Why is it too late? They have increased profit margins through the year. Business 101 says, that's not a company folding by any means. Their profit margins are shrinking. And, with cheaper version of iphones coming out, it's going to shrink even further. Everyone's profit margins are shrinking including Samsung. But speaking on 2013 annual fiscal reports, according to WSJ, Apple has seen an increase in profit revenue throughout the year. But the fact is, most major companies are losing profits. Even Samsung missed their expectations by nearly 10%. That doesn't mean they're "dying". Also, explain to me how they're profit margins are going to shrink further? I would like to know your take on that. Thank you, Sherlock. We had no idea how to multiply. Told y'all that Apple manipulated the stock. I said around $380 to buy, cause it'll soon be back on the rise (within a few weeks well over $500). Samsung is doing the same with the low numbers. Apple is a business. They're going to do anything that will help them in the long run. I'm really surprised they bought back 36 million shares because $16 billion dollars seems like a definite fortune to the average person but small change to Apple. Good move on their part. Yeah I agree, business is business. Warren Buffet told Jobs to do this and was ignored. Could have went a long way to helping their current stock standings if he would have listened. Well done, Tim. I can't believe I asked this question without reading yours lol. I'm wondering the same. I know nothing of how stock works. What does this mean for Apple? It means apple believes in itself, and they want everyone to believe in them too. and the "We continue to generate cash in excess of our needs to operate the business, " part means they want you to think they are doing better than ever. Well, buying back your own company from others means you have more control of it when the good times come. That said, if they bought their shares back for $444.44 each, in a batch of 16 million, when this years iDevices come around the shelves the shares will (probably) get a 50%+ rise, and if Apple decides to burn (part of) them down on the stock market again, profit! However, buying a lot of shares from your own company has some setbacks, as a matter of fact the shares are now down to $438 (because the shareholders get suspicious and decide to sell theirs as fast as they can. thus lowering the company's value) but that's no major concern, by August they should rise to $600~700 mark. A & B each has 50% share,and the each of their share value is $500. now they start a business and earn $1000. instead of share the profit among them, A decided to keep it for a while. after a while, share price drop to $400, A offer B to purchased his 50% share @ value of $400. and B accepted. So A take out $400 from the profit and gave it to B. now the profit left 600. In the end, A has the 100% of share while still keeping $600 of profit in his hand. B has 0% share and $400. No dummies that means there buying while there stock is at an all time low because something big is coming that's going to increase stock value. I swear people don't know anything about the stock market. Just like Samsung sold more but they lost more which can hurt your stock value in later quarters. You do know that Apple is a long way from an "all time low" in stock price. This plain and simple a way for Apple to increase their stock position. They are showing confidence in the company. "With that kind of money Apple could have snapped a company like Nokia and still have some money left over." WTF Chris P.? The problem was always the fact that Nokia does not want to be sold, not that there was no one to buy them. In that case, you could have used Microsoft as the example and your "perspective" would have been much more effective??!! do u know that by ur statement u r like saying that because nokia's Market capital is 15.17 billion dollars (shares multiplied by the price of shares) , apple can grab it for 16 billion dollars and still have some money ??? ?http://www.google.com/finance?cid=657729 so since when is the price of company equal to its market capital ???? i don't want to be aggressive or offensive, but tell this to someone with some basic economics or business background, he would just laugh out pretty much loud, the price of a company involves a lot more than that and market capital has nothing to do with its price....a company like nokia if its going to be sold will be priced by no less than 40 billion dollars (the patents portfolio is big enough to drive the price higher) so this comparison is pretty awkward ,pointless, points to ur ignorance about business models and seems to be for sake of some company Vs company comments. next time , if u want to show some comparisons, make sure to cover all the basic info and basics of these comparisons, otherwise just stick to the info in the source. muhsen, I am not mixing anything up :)... you talk about the context a lot, don't disregard it then? The fact is, they are a publicly traded company, therefore they can be bought, whether the Board and CEO want it, or not. A good enough offer would have to be heard, and if rejected, a company could just start buying from shareholders until they acquired a controlling interest. Who maintains the controlling stock? If Nokia has the biggest percentage, or more than 50%, your point is true but won't happen unless Nokia wants to be sold. I honestly don't know how much of their own stock they own but they'd had have been insane to not cover that base properly.